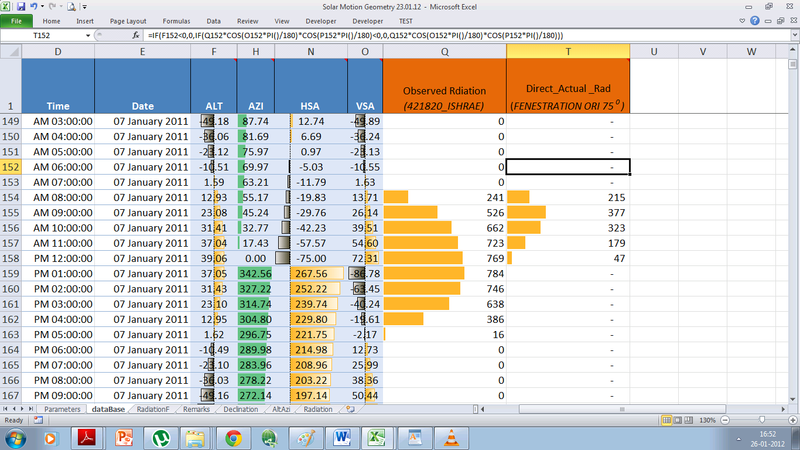 The paper models façade elements through Excel which is the most popular spread sheet application. A basic solar model using the well-known formula generates the altitude and azimuth angles for all 8760 hours of the year. The direct solar intensities at any hour for a given orientation are worked out by factoring the observed Direct Normal Solar Radiation with calculated altitude and azimuth. The ease in spread sheet application use and instant graphical results makes the model very suitable for creating energy scenarios for variously oriented facade elements. The effect of different orientations, shadings and other parameters thus evaluated can be tabulated for further value analysis considering all aspects including the energy savings. The energy efficiency of any habitat is best planned at the initial design stage. However no software for quantifying the energy implications of facade elements is available. Intuitive approach is followed by the architect as the graphical methods available are too cumbersome to be followed. The importance of initial energy planning cannot be overemphasized as going back from initial concepts may involve lot of re-work and may not be acceptable to stakeholders who have been involved during the evolution of initial concept. Manual graphical method of energy implication quantification of a façade require voluminous calculations and are limited to classroom education. 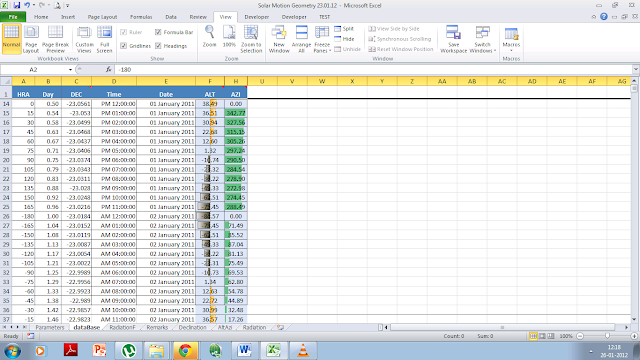 Using popular software for energy simulation at this stage is as impractical as the manual methods. Therefore this vital opportunity for energy savings is missed as a routine. The spread sheet software has been quite powerful for quite some time. However their recent up gradations particularly in terms of data base applications and graphical capabilities has only made it practically possible for its use. Our approach while working out the solution is based on writing step wise formulae which are already taught in the classrooms into an easily understood format which is friendly to data summations and other analysis. 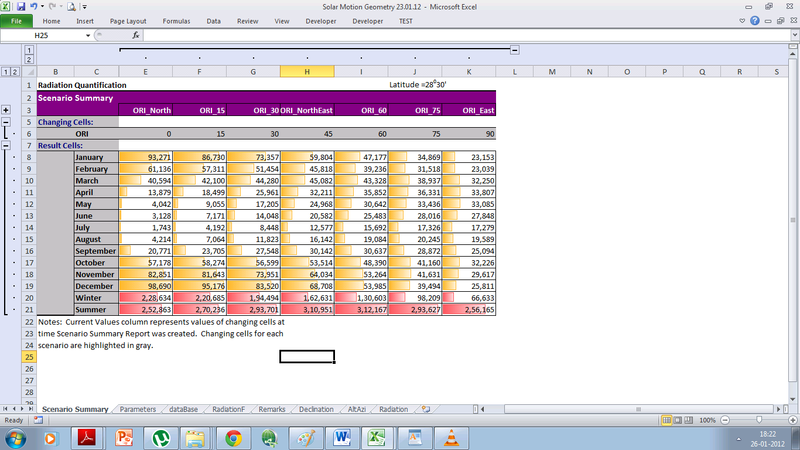 The data such created has been organized for easy understanding while meeting defined requirements. Glass façade elements of a residential tower located at Greater Noida (Latitude 280.30’) has been simulated as an example. The following abbreviations and sign conventions have been used. Altitude (ALT)-measured in vertical plane, between the sun’s direction and the horizon plane. Azimuth (AZI)-The direction of the sun measured in the horizontal plane from north in a clockwise direction (Thus East=90 deg. South= 180 deg. , west=270 deg. while north can be 360deg. or 00 deg. 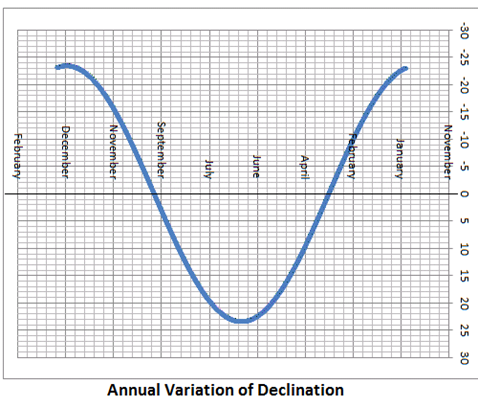 Declination has been estimated as per the following simple equation. As the year 365 days corresponds to a full circle (360 degrees ) , 300/385 = .986 have been applied as multiplier in the above formula. 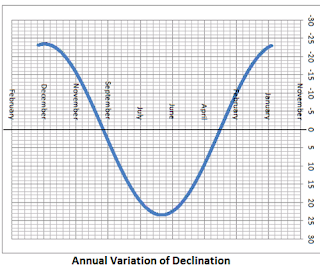 To synchronize the Sin curve with the calendar, the distance from the March equinox to the end of the year (284 days) are added in the NDY(Number of the day of the year). Azimuth is calculated using the formula below. The filter and charting features allow us to instantaneously see the results in an easy comprehensible format. 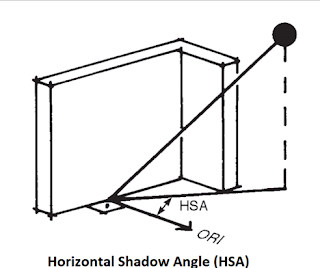 The performance of a vertical shading device is measured by the horizontal shadow angle (HSA). This is defined as the difference between the azimuth angle of the sun and the orientation azimuth (ORI) of the building face. This will be positive if the sun is clockwise from the orientation but negative when the sun is anticlockwise. 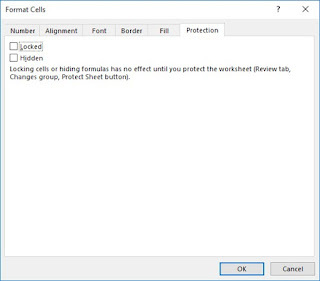 The following if functions have been included in the spread sheet formula while working out the radiation on a fenestration element. The performance of the horizontal shading device is measured by the vertical shadow angle (VSA). 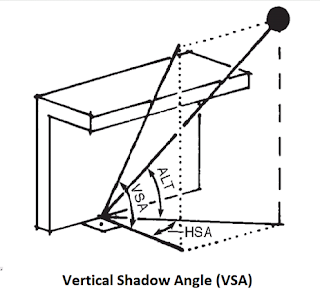 VSA is measured as the sun’s position projected parallel with the building face onto a vertical plane normal to the building face, and can be found from the expression. Both HSA and VSA can be used either to quantify the performance of a given shading device or to specify the required shading performance for a device yet to be designed to be effective. 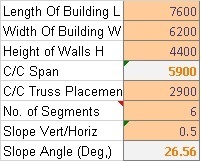 The angle of incidence (INC) has been worked out using following equation. The following chart shows the calculated radiation for a fenestration oriented at 75 degrees at 11.00 AM, without any vertical or horizontal protection. 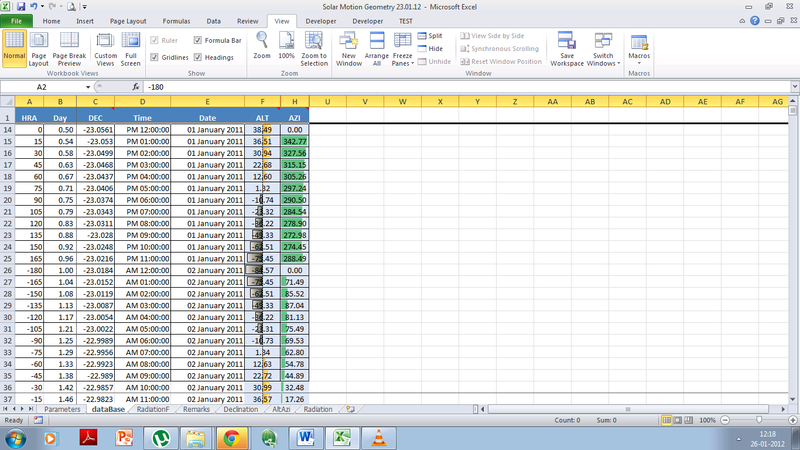 Data for Direct Normal Solar Radiation has been adopted from “Statistics for IND_New.Delhi. 421820_ISHRAE for New Delhi.” The radiation received for any fenestration orientation can be viewed simply by entering it in the parameters sheet of the spread sheet. is summarized with a click of button. Now that the radiation without any protection has been analysed and quantified, various strategies for control like providing horizontal and vertical shading and or use of reflective glass can again be quantified. design phase. 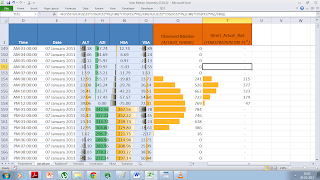 The spread sheet simulation model can be utilized from the earliest fenestration planning stage and can greatly facilitate the rational decision making of the fenestration elements. The model is also adaptable for designing optimal orientations for solar panels and solar water heating systems etc. It can further guide us on landscape planning as various plants are best suited for particular solar exposures and others require minimum sunshine hours for efficient flowering. The uses of the model which is expandable are virtually limited by our imagination. (2010 Phys. Educ. 45 641). Ashutosh Kumar Pathak is General Manager (Projects/Civil) with Jaypee Group. He has done his M.Tech in Building Science & Construction Management from IIT Delhi and is an Indian Green Building Council Accredited Professional. He is also a Project Management Professional (PMP) from the PMI (Project Management Institute) and Microsoft Certified Applications (Excel) & Technology (MS Project) Specialist. He has vast experience in building design and civil construction. He is keenly interested in sustainable habitats and has made several presentations in various national and international conferences on Sustainability and Green Buildings. Anagh is working towards a Master of Science degree in physics and a Bachelor degree in chemical engineering from the Birla Institute of Technolgy and Sciences, Pilani. He is fascinated with material sciences and its applications in nanotechnology. His other interests include solar motion geometry, sustainable design and engineering. This is very nice..very well related to what my colleagues and I do at work. You should also look into daylight and facade optimization strategies using software like Grasshopper, radiance, DIVA and Daysim etc. 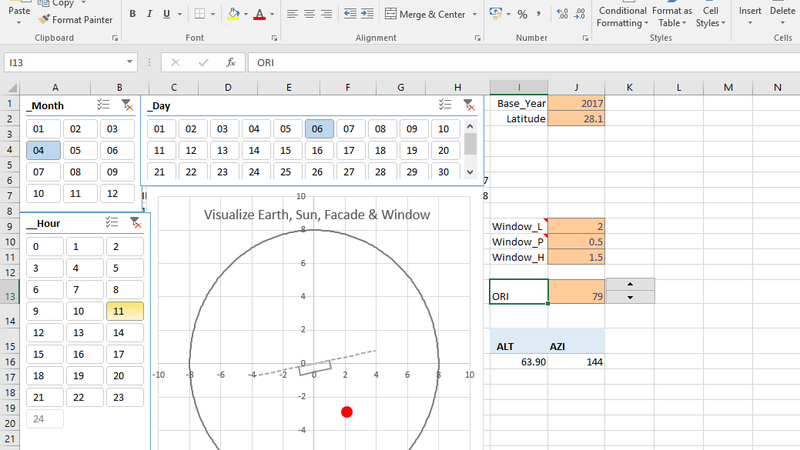 They are very intricate software that translate to spreadsheet, VB formats and can even be connected to structural engineering and energy modeling tools. I shall go through the above sites and seek your help/suggestions at appropriate time.